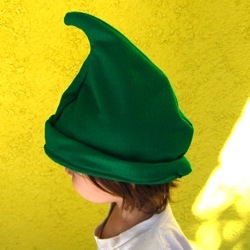 Here is a free elf hat pattern that is perfect for a quick sew project. Felt or fleece are thick and stand up well on their own, so the little point on top of the hat will stay upright. Thinner fabrics will have a tendency to flop over at the top but feel free to experiment. I used standard felt for this, but a felted sweater material could also be cute! Changing the color will determine what kind of elf you have (according to my now three year old) so get creative! 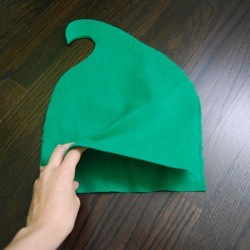 Red and green fabric will turn this elf hat pattern into a Christmas elf for example. 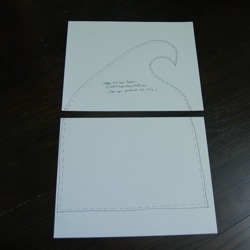 This hat is meant to be worn with the brim folded so the size is relatively adjustable because of this. It should fit sizes 2T to 3T ideally, but if you fold the bottom edge brim even more it will probably work on a one year old even. 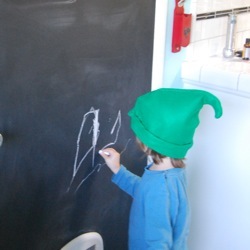 The free printable elf hat pattern prints on two sheets of regular paper, just tape them together and then cut out your template. Just two pieces of fabric need to be cut! So easy. Here is the free elf hat pattern PDF for you to print! As with all of my patterns, it is free for you to use at home, but it is not to be used for items to sell. This one is so easy I won't bother with step by step instructions. Just print out the pattern, trace and cut two pieces of felt, sew the sides together, turn right side out and then fold up the brim! 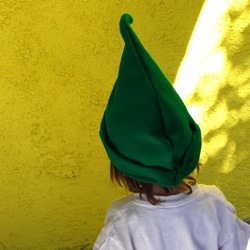 The hat can be worn with the point facing forward or backwards, up to you...or rather, up to your little elf! 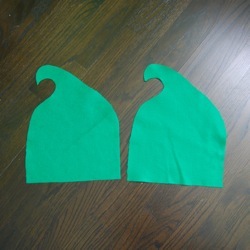 Have fun with this elf hat pattern! I'd love to see what you do with it and what fabrics you try out. Share your finished elf hat photos with us! Return to the Baby Clothes Patterns or the Baby Costume Patterns section for more project ideas!